AUSTIN, TX (June 5, 2018) Vyopta Incorporated, the leading provider of unified communications and collaboration monitoring and analytics, today announced a new product to help customers understand and improve conference room usage. People, technology, and real estate are the three bigests costs for corporations, and conference rooms are the convergence of all three. Increasingly, the over 60 million conference rooms globally are being equipped with collaboration technology including video conferencing systems. However, employees typically struggle to reserve rooms despite the fact that the average conference room is only used 32% of the time. In addition, rooms and room technology are often misused with large rooms used for small meetings or video enabled rooms used for in-person meetings. Sub-optimal conference room utilization leads to billions of dollars of wasted spend, employee frustration, and lost productivity. Identifying underutilized and misutilized conference rooms and room technology (e.g., video conferencing systems) to scope potential optimization opportunities. 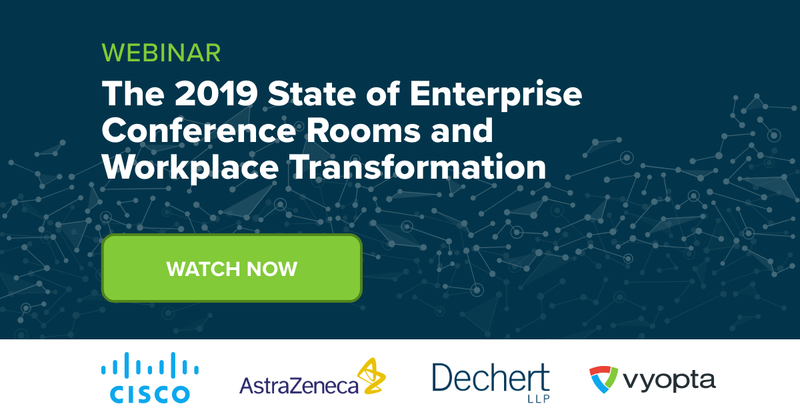 With over 60 thousand employees globally working to bring new drugs to market, improving collaboration and conference room usage is vital to AstraZeneca. Ability to integrate people counting capabilities from newer endpoints with facial recognition technology, such as Cisco Webex Room Kits. Exchange integration to automate analysis of conference room information such as capacity, scheduling, attendance, and meeting ownership. Inclusion of endpoint usage and performance details such as presentation, presence, audio, video, peripherals and more. You can also see the new product in action at Infocomm June 6-8th in Las Vegas (Booth #1576), or Cisco Live (Collaboration Village) in Orlando, June 10-14th. Vyopta is a leading provider of unified communications and collaboration performance management solutions. Vyopta monitors over 2 billion minutes of unified communications and collaboration meetings conducted annually on systems including: Cisco, Microsoft, Polycom, Pexip, BlueJeans, Zoom and more. Our products are used in over 20 industries by the largest enterprises in the world including Bloomberg, AIG, Stanford University, and the US Department of Veterans Affairs. Vyopta is headquartered in Austin, TX. Learn more at vyopta.com.